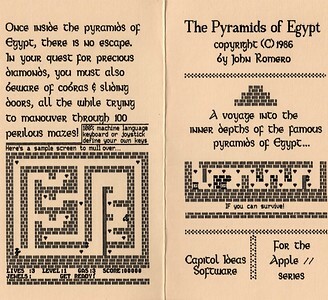 I wanted to make a big maze game with lots of levels ala Lode Runner so I created this crazy thing in Jan-Feb 1985. 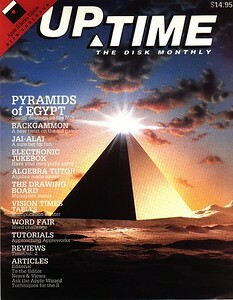 It was eventually published on UpTime Disk Monthly in 1987. 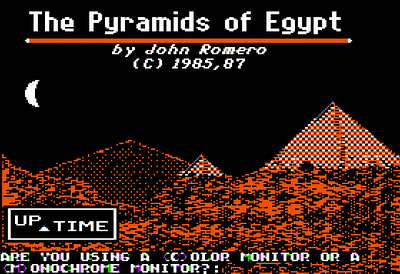 I actually made a PC and Commodore 64 version of this game! 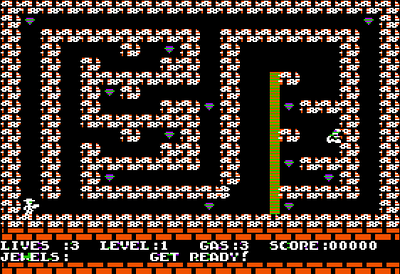 The PC version was published but the C64 version never made it (I didn't finish polishing it) and the disk has crumbled into plastic particles (not really, I just lost it). When you boot the disk this is the menu/shell you get to navigate the contents from. Don't press 'H' for help - it's just a picture. Thank you. 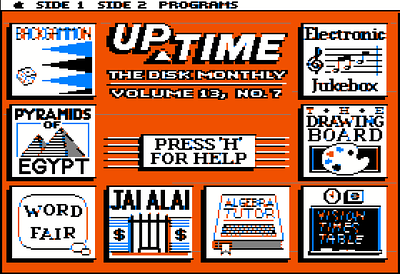 Even though there are already instructions in the game, UpTime liked to keep things consistent so they wrote instructions you could read from their shell program. I did not write these instructions, heh. This is a title screen that I created two years after I finished the game so it was UpTime "branded". Originally there weren't graphics on this screen, just the question at the bottom of a blank screen. Here's my title screen! 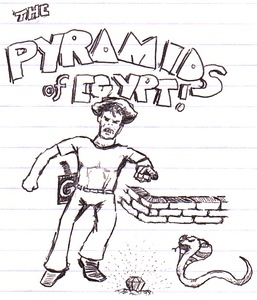 I think I drew the name of the game with line skipping because I was inspired by Nasir's "Phantoms Five" game's look. Or something. 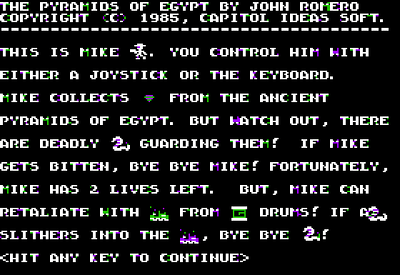 The main character, Mike, runs through the little title maze there and repeats ad nauseum. God that noise got irritating! Welcome to level 1! Basic rules: walk over the jewels to pick them up and avoid or burn the cobra. If the cobra touches you, you scream and flip around with blood pumping out of your stomach. 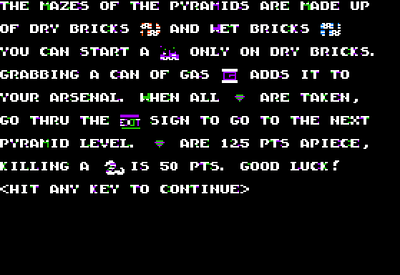 Here are the in-game instructions. 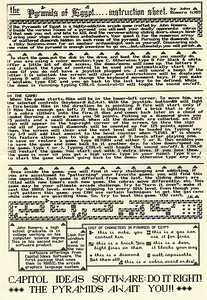 Second page of in-game ANIMATED instructions. Oh so innovative. 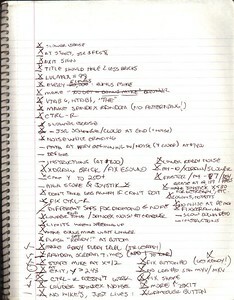 More notes for the re-polishing effort for UpTime. 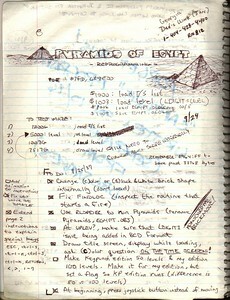 My little crypto notes for polishing POE. 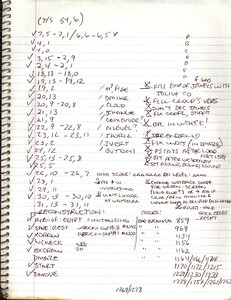 More re-publishing notes for UpTime. Here's a JPG for you to mull over... This is the cover to the ziploc-baggie version that I sold while I worked at The Software Centre in Salt Lake City. The instructions and 5.25" disk were included. The copyright date is 1986, the year I was selling it in stores. 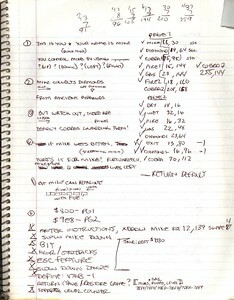 The game was written a full year earlier but I didn't think I'd sell so many copies if it looked a year old. That bit of tomfoolery got an extra 5 copies sold! 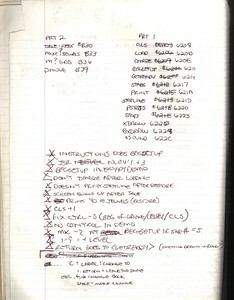 Here are the Fontrix-produced instructions, just like Subnodule. Love the newly-minted and never-again-used catchphrase: DO IT RIGHT! LOL. Oh, I love to draw! 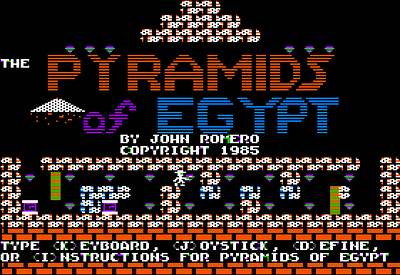 This is the title screen for the PC version of Pyramids of Egypt. Menu screen for the PC version. Level 2. "Get Ready" just like Pac-Man.